You know the nights you get home from your workday and you are just so pooped it feels like it may be easier to eat an entire bag of chips than take time to make a healthy dinner? It’s not a pretty sight… I get whiny and draggy and I’m pretty sure my fiance (yes, we just got engaged this week, I am on cloud 9!) wants to stick me in the frying pan right along with the veggies. My favorite part of this dish, besides the fact that it is healthy, is the sweet and salty flavors of Coconut Aminos. You can buy this alternative to soy sauce online or at Whole Foods. Not only does this replace soy (for those who are sensitive or who follow a Paleo diet), this baby is jam packed with healthy amino acids which are the fundamental building blocks of our tissues. 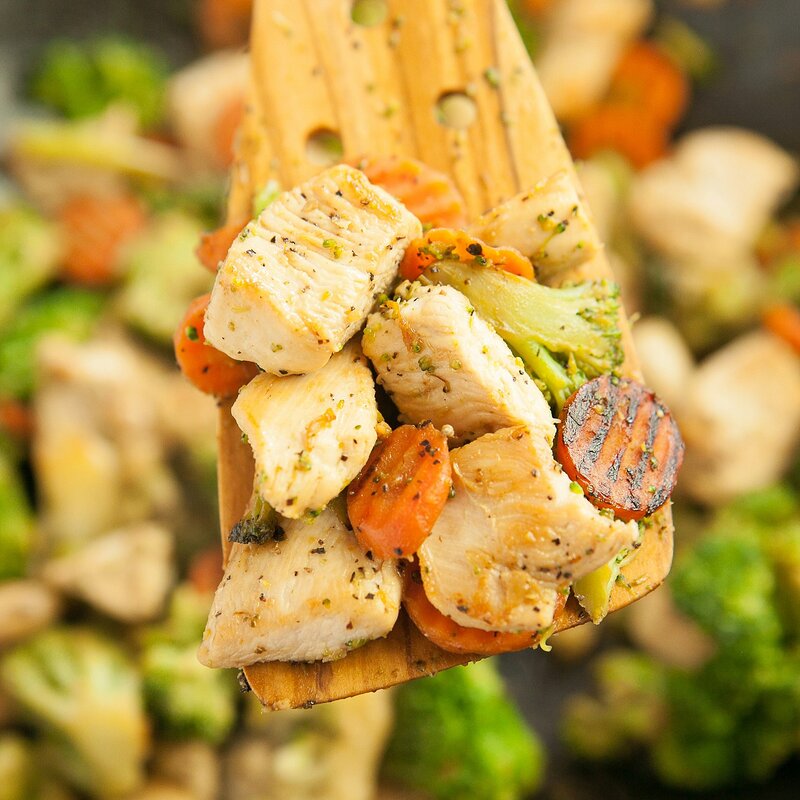 I hope this recipe will become a staple in your yummy food repertoire for the nights you need to make something quick that will still fuel you in a healthy way! Warm a heavy bottomed skillet or wok (we’ve used the Staub Wok) over medium heat and add 2 tablespoons of olive oil, don’t allow to reach smoking point. Cut chicken breasts into bite sized chunks and add to warmed pan. Cook over medium-high heat until pieces begin to brown on the edges. Remove from pan and set aside. 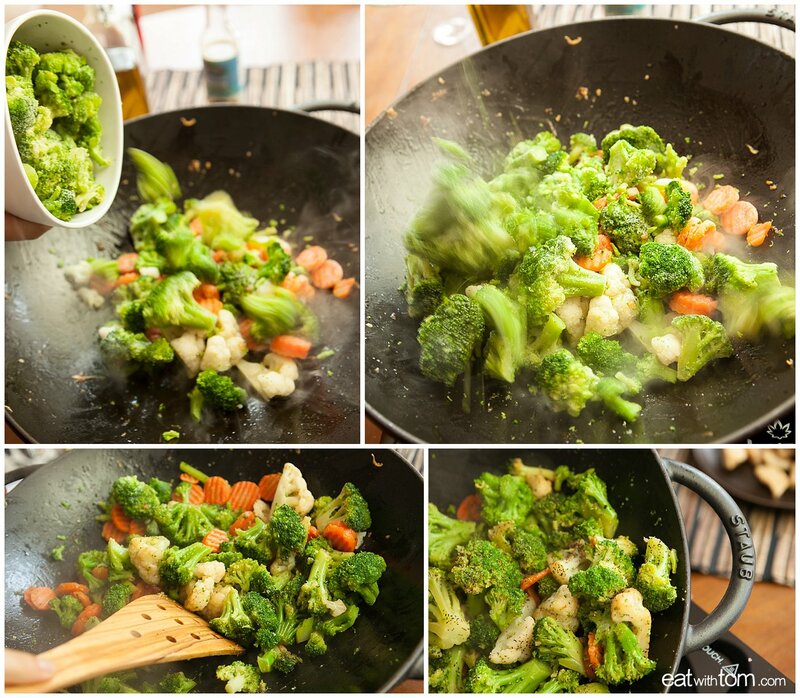 Add 2 tablespoons of olive oil, 2 tablespoons of the coconut aminos and frozen veggies to pan. Stir gently and cook until veggies are soft. Add chicken back to pan, combine with veggies and cook another 1-2 minutes. Add Coconut Aminos, Himalayan sea salt and pepper to taste. This extremely simple Stir-Fry recipe will leave your taste-buds feeling like you slaved over the stove when in fact you threw together a package of organic chicken (make high quality meat a priority!) and some pre-cut frozen veggies in a pan and pushed "go." Warm a heavy bottomed skillet or wok (we've used the Staub Wok) over medium heat and add 2 tablespoons of olive oil, don’t allow to reach smoking point. Cut chicken breasts into bite sized chunks and add to warmed pan. I prefer to season the chicken with cayenne, ginger powder, kosher salt, black pepper, coriander seed and lemon juice before cooking. For veggies I do broccoli, red bell pepper and water chestnuts. Delicious! !